Be kind to your expensive composite, poly or wood kayak! The experts are paddlers here at Oak Orchard and know what it takes to build the ideal J-Cradle. Since both sides are padded, our Stainless Steel Stacker J-Cradles can used to secure one kayak on one side, and as a "stacker" for one more kayak on the other side. It has Stainless Steel construction and rubberized Trimlock edging and deluxe rubber padded surface. All exposed edges are completely padded for the ultimate protection and security. The Oak Orchard "J-Cradles" -without a doubt, the best way to carry a kayak, on it's side. Works great on round Yakima crossbars; when empty both J-Cradles can be loosened and tilt over flat so you can easily reach straps or even drive into your garage! Our Stainless 'J' has two mounts which can "straddle" the tower base - thus moving it "out" and closer to you for easier loading! Won't slide around on your rack like those with only one mount per cradle. 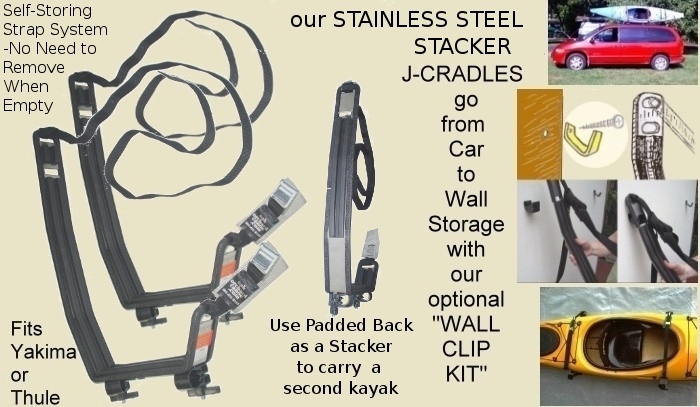 Use Our Stainless Steel Stacker J-Cradles to store your kayak on a wall with the optional Wall Clip Kit. Kayaks are less likely to dent when carried on their stiffer sides! Includes two patented - easy load - no step stool required - straps! Always use bow and stern straps (sold separately) when transporting your kayak on any rack, cradle or saddle. "Universal Mount" Fits most oval or wing shape rack crossbars. "Snap-Around Mount" Fits Yakima Round bars or Thule rectangle/square bars only.